Keith Broomfield died fighting alongside Kurdish YPG forces; mother says she's waiting for his body to come home for burial. An American man has been killed in Syria, the State Department said Wednesday, without confirming a report that he died fighting alongside Kurdish forces against the Islamic State group. Spokesman Jeff Rathke confirmed the death of Keith Broomfield, but refused to offer further details about the circumstances or when it occurred. NBC News earlier reported on the death of the 36-year-old Broomfield, citing a Kurdish official in Kobane as saying the US citizen died in a battle with ISIS jihadists in the area. Reports said he may have been fighting with the Kurdish People's Protection Unit (YPG), which is battling the Islamic State group in northern Syria. Broomfield's mother confirmed his death in a telephone interview with NBC. "I'm waiting for his body to come back," she told the network. The United States says that about 100 of its nationals have joined ISIS fighters in Iraq or Syria, while other Americans are fighting against the jihadist group. 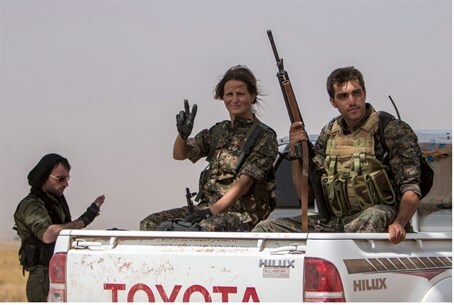 Other westerners have also joined the fight against ISIS, usually by enlisting in the YPG, which despite being relatively poorly equipped has proven the most effective force against Islamic State, ejecting it from hundreds of villages and towns. Most western volunteers are military veterans, but some are simply civilians who signed up after hearing of ISIS atrocities - including Hollywood actor Michael Enright. Washington has strongly urged Americans not to travel to the area with the aim of joining the battle.